At 9:00 AM (Pyongyang Time) on Tuesday, July 4, 2017, North Korea conducted what appears to be the first successful test of its Hwasong-14 intercontinental ballistic missile (ICBM). 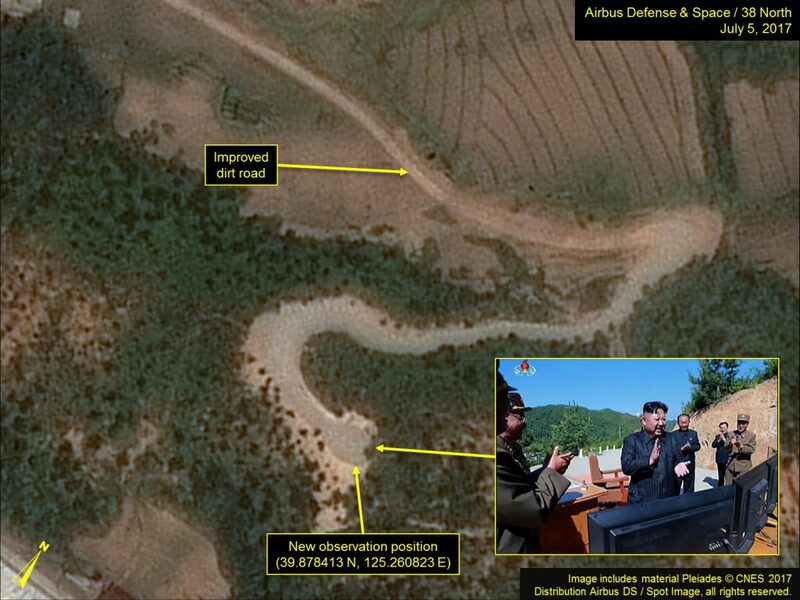 While initial reports stated that the launch took place from Panghyon Airbase in North Pyongan Province, subsequent analysis geolocated the launch site in a valley 8 km to the southeast. 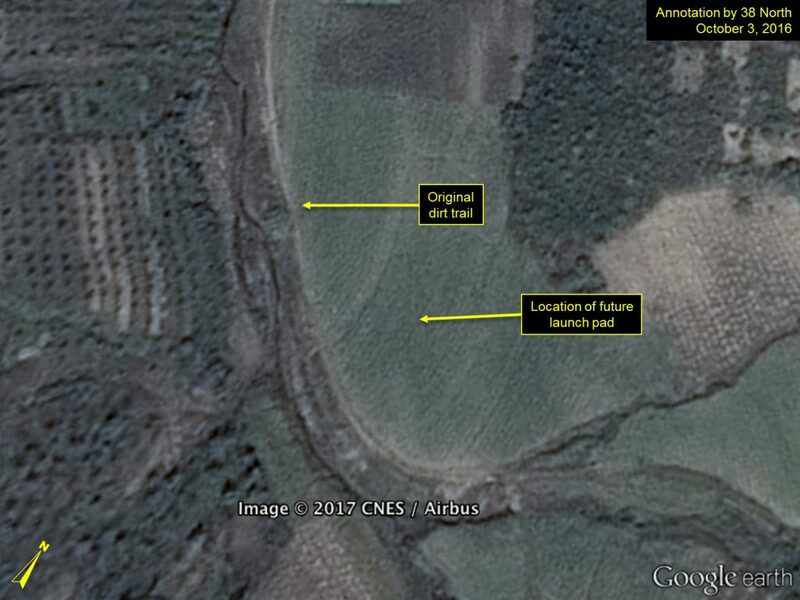 This valley, and the surrounding area, houses the Panghyon Aircraft Factory—North Korea’s primary aircraft production, repair and research facility established in the mid-1980s. This is the first time that this location has been used for a ballistic missile launch and, much in the same manner as the Iha-ri Driver Training and Test Facility was used for the first Pukguksong-2 test, it demonstrates the North’s increasing ability to launch ballistic missiles from anywhere in the nation. Figure 1. The Panghyon Aircraft Factory, site of the July 4 Hwasong-14 test launch. A second dirt trail, at the southern end of the facility, was also improved and led to a newly graded circular area (approximately 85 meters in diameter) in which a concrete pad measuring 62 meters by 20 meters was poured. It was this pad that was used for the Hwasong-14 test. The new concrete launch pad is larger than those at the Iha-ri Driver Training and Test Facility (approximately 20 meters in diameter), the Kalma Launch Site (24 meters by 17 meters), the Tonghae Satellite Launching Ground (30 meters in diameter) and other locations. It is large enough to handle all transporter-erector-launchers (TELs) or mobile-erector-launchers (MELs) known, or believed, to be in North Korea’s Strategic Force inventory. This may be an indicator that the site could be used for future research, test and development launches. Figure 2. 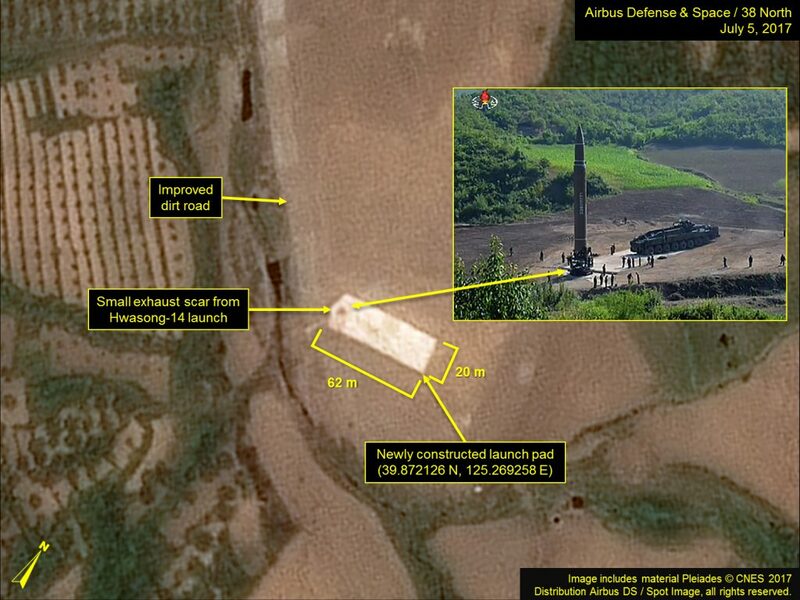 The Hwasong-14 was launched from a newly constructed launch pad, large enough for all known North Korean TELs and MELs. Before: Image © Google Earth 2017. After: Image includes material Pleiades © CNES 2017. Distribution Airbus DS / Spot Image, all rights reserved. For media licensing options, please contact [email protected] Inset photo: KCTV. 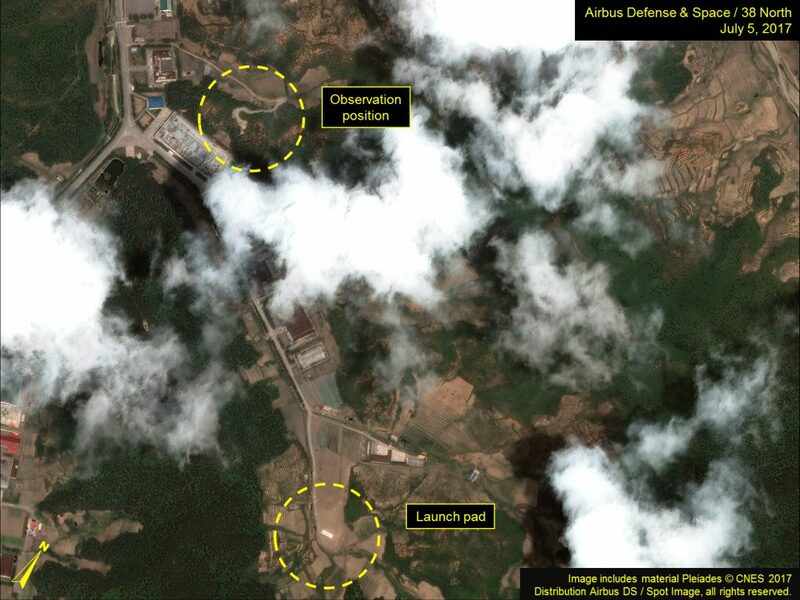 Commercial satellite imagery from July 5—just 30 hours after the Hwasong-14 launch—shows not only Kim’s observation position but also the launch pad. Although nothing of significance is noted at the observation position, a relatively small (5 meters in diameter) exhaust scar can be seen on the concrete launch pad. It is important to note that, contrary to popular belief, a successful ballistic missile launch—even one as large as an ICBM—does not leave large exhaust scars; they generally leave only small scars regardless of the size of the missile launched. Analysis of the entire Panghyon Aircraft Factory area shows no evidence of any additional missile-related activity. Figure 3. 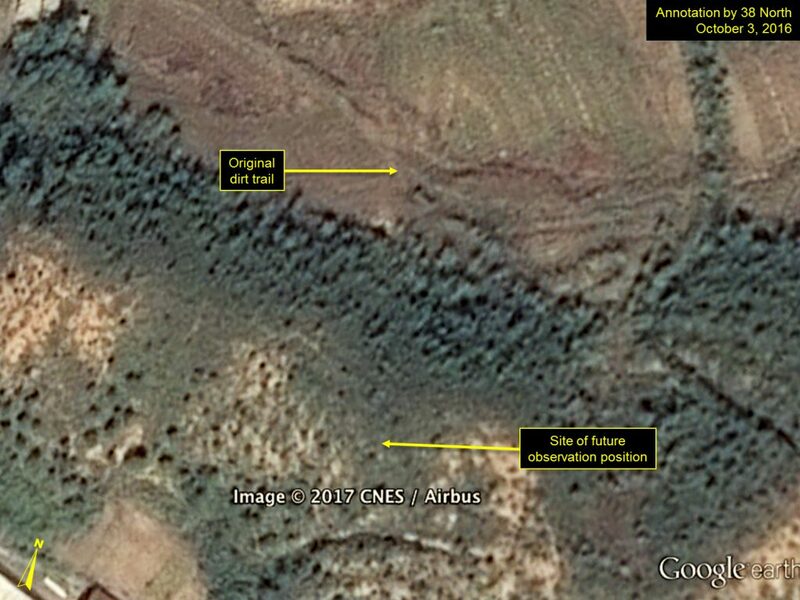 The recently constructed observation position used by Kim Jong Un during the Hwasong-14 test launch. It is presently unclear why the Panghyon Aircraft Factory location was chosen for the test. Given the facility’s central role in the North’s aviation industry it is likely involved at some level in ballistic missile research and development or production. In any case, the decision to conduct the test from this facility continues to demonstrate the North’s increasing ability to launch ballistic missiles from anywhere in the nation, complicating any future missions to eliminate the North’s missile capabilities in wartime, during a military response to some future provocation, or even in some type of preventive strike attempt against missile facilities. Joseph S. Bermudez, Jr., Shield of the Great Leader: The Armed Forces of North Korea, London: I.B. Taurus, 2001, pp. 156-160.